Join the discussion on our forums! 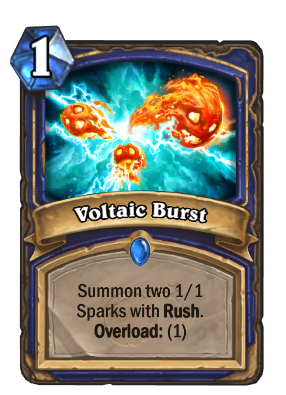 Come discuss Voltaic Burst over in our dedicated Voltaic Burst discussion topic. Batteries have three components: Cathode, Anode, and Overload. I made the same face as the elementals on the card when I discovered it. This seems to be on a similar power level to Living Roots. Flametongue makes this card much better. It's definitely not a card that feels great play turn 1 without the coin or another 1 drop. However, every 1 mana card that summons 2 1/1's has been played competitively one way or another. This card has some potential. Placing will be even more important for shaman, huh? So if these Sparks have Rush, are they made of positive or negative energy? Will I play this is my Shaman deck? No. Will I be happy every time this comes out of Witch's Caludron? ABSOLUTELY. Living Roots or Lost in the Jungle with rush? Seems good. 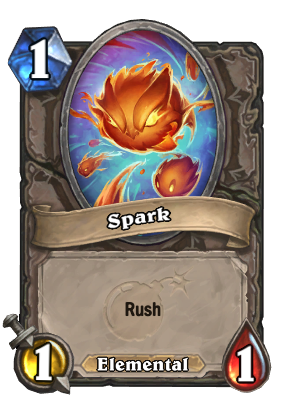 Come on Blizz, the card summons 2 Sparks, but the artwork shows 3. Are the Sparks elementals? Although most elemental synergy is with playing (not summoning) minions, it would matter for Earthen Might. Yes they are. 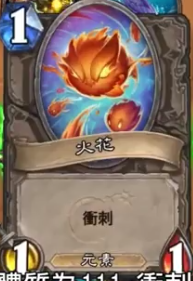 Sorry but all I could find was the Chinese version of the card, from the card reveal video. Well, yeah. 1 mana overload cards are always iffy. Decent enough in wild too with Tunnel Trogg on two though. Totem Golem is probably better though. Could run both though for the full cancer experience.